After the holidays, many clients come in complaining of constipation, bloating and fatigue and/or feeling sluggish, with headaches and pain. The holidays can do that to us – especially with changes in diet, exercise and water consumption. Every 7 years we have a molecular cell change, every 180 days a blood change and every 7 days a bowel lining change, which is why the celebratory season can leave our bowels in such a mess. Poor elimination created by bad eating habits, environmental factors, and drug and chemical intake not only causes a build-up of toxic overload but also creates a breeding ground for parasite infestation. When we eat a poor diet including excessive caffeine, alcohol, simple carbohydrates and too much animal protein, the bowel becomes sluggish and slow to eliminate waste. In turn, this slow elimination allows waste material to ferment and become rancid and then recirculate through the body as toxic substances. An imbalance of bacteria in the gut has been associated with many antibiotic-resistant infections, metabolic disorders and gastrointestinal disorders. We have trillions of microbial cells within our body; the microbiome is made up of organisms that live within your gut. When our immune system is strong, our T-cells recognize certain proteins as friendly and leaves them alone, while it recognizes others as invasive bacteria causing our T-cells to attack. So what can you do to get your system back on track? Take Probiotics. Using a good series of probiotic can help the body keep good bacterium within the gut and prevent the bad from adhering to, and building up within the intestinal wall. This, in turn, stops and prevents problematic disease from continuing or forming. Hydrate. Remember that although the weather is cooler, you still need to drink a lot of water. When the body is dehydrated it becomes more constipated and reluctant to allow the colon to do its job and eliminate toxins. Avoid Laxatives. Laxatives will cause a swelling within the colon and an unnatural evacuation which flattens the small ecoli hairs on the colon walls. When the colon hairs are moving and working correctly we are more regular with our bowel movements, but when they are not, the body becomes more reliant on unnatural remedies to assist. The problem, however, is that taking too much fiber – especially mixed with artificial colors, dyes and sugar-creates more constipation because the body is not fixing, healing and working naturally. 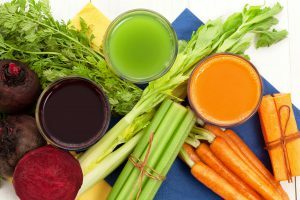 Organic vegetable juices can assist with a post-holiday cleanse. Add Natural Fiber. By helping our bodies with additional fiber found in foods and antioxidants from vegetables, bowel movements become normal and natural daily. It is normal to have 1 to 6 bowel movements per day as long as they are fairly firm and good in color. Extremely runny/watery, hard pebble-like or pencil thin is not healthy. If there is a lot of dark blood in the stool, this may indicate a more serious health issue and should be checked by your doctor. With that said, color can be affected by what we eat – maybe you had a lot of dark greens – your stool would reflect that, just as drinking a beet juice would cause a red/pink look in the toilet – don’t confuse that with blood. Consider a Colon Cleanse. Following this simple colon remedy for 3 to 5 days will help the body to naturally heal and will have you feeling better in no time. Breakfast: Soak a mix of dried prunes, figs and raisins the night before; take 4 Tbsp. with 1 Tbsp. blackstrap molasses and mix with 6 oz dairy-free yogurt and ½ cup wheat-free granola or 1 cup oatmeal. Mid-morning: Have 12 ounces of fresh organic carrot/beet/celery juice with a wedge of apple. Lunch: Have a fresh green salad every day with lemon/oil dressing or steamed veggies and a baked red-skin potato with low fat goat or rice cheese. Mid-afternoon: Have 12 oz fresh organic carrot/beet/celery juice with a wedge of apple. Dinner: Have a large dinner salad with pureed lentil soup (Note: if you have diarrhea, or a bowel disorder such as IBS, colitis or diverticulitis, pureeing the lentils is important as the whole bean will cause more issues). Drink 1 to 2 cups of Pau de arco tea in the day and 64-80 oz of water. And don’t forget to make sure everything you’re eating is certified organic and non-GMO. Here’s to a happy colon and a healthy 2017! Dr. Beckner is owner of Your Body Code personalized nutrition and wellness programs in Palm Desert and can be reached at (760) 341.BODY(2639). For free recipes and more information visit www.yourbodycode.com. Sources: 1) Amanda Beckner CN, HHP, PhD, Your Body Code, copyright 2009; 2) Linda Rector-Page PhD, Healthy Healing an alternative healing reference, copyright 1992; 3) Robert Rister, Healing without Medication, copyright 2003.